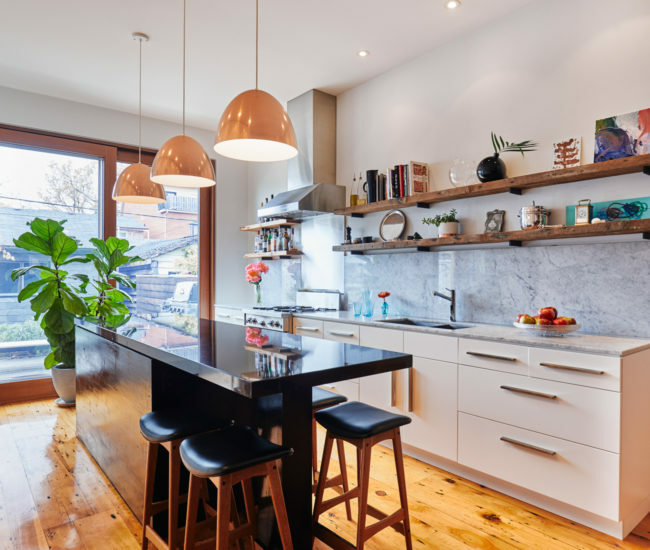 Architect, artist and designer Joy Charbonneau knows exactly when she started renovating her house in Trinity Bellwoods. 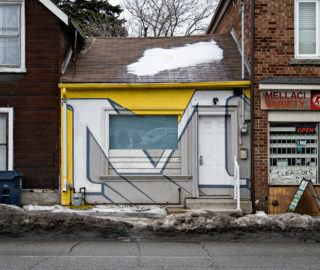 It was the fall of 2009, just after she bought the two-storey, 161-square-metre place with furniture designer and maker Derek McLeod. Almost 10 years later, an end date is harder to pin down. “I prefer to say it’s been slowly getting more comfortable since 2009,” says Charbonneau, who lives in the house with their son Otis. 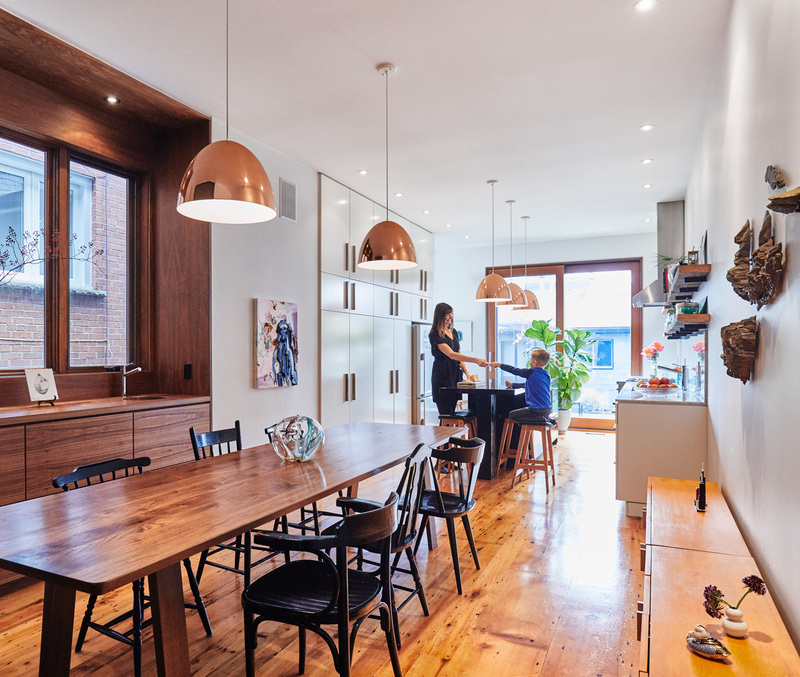 The expansive west-facing dining and kitchen areas replaced what was once a series of low-ceilinged additions. 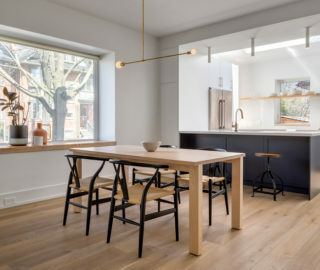 Furniture by Derek McLeod Design includes the American walnut bar, “15 Light” pendants and the dining table. 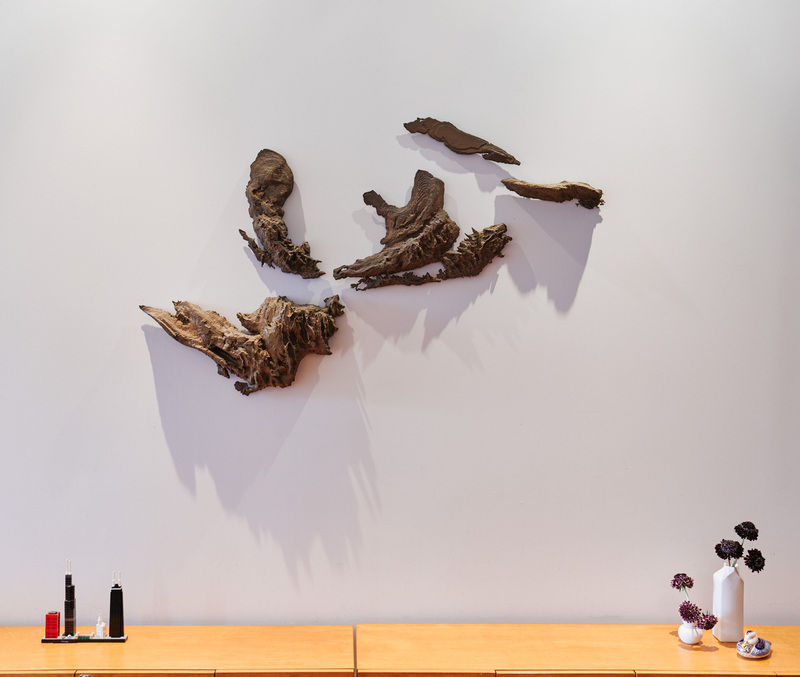 In the dining area, Charbonneau’s solid bronze Volumetric Model of the Great Lakes decorates a wall. The long, somewhat interminable timeline is partly because there was an incredibly long to-do list – which was no surprise. The duo bought the property knowing it would be a challenge. 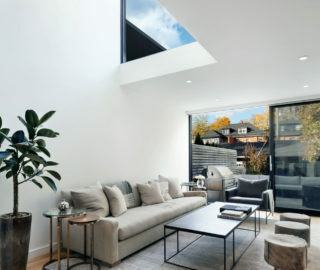 They loved some of the home’s features, including the nearly four-metre-high ceilings in the original 1880 structure and the turned-wood railing wrapping up the staircase. Yet they wanted to update the worn interiors and replace a series of hastily done, low-ceilinged rear additions. “An engineer friend told me the structure wasn’t sound enough to put a collection of books upstairs,” she says. 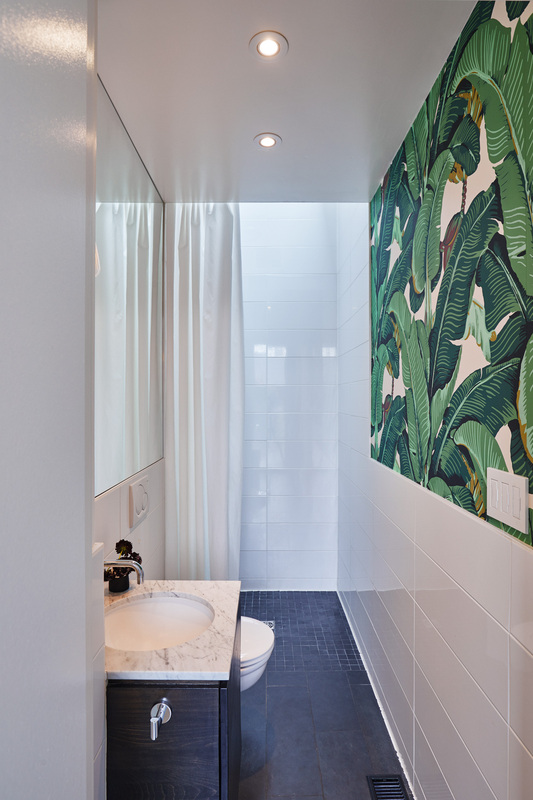 The main floor bathroom includes a three-metre-high skylight in the shower and a botanical “selfie wall.” Carrara counter by York Marble; faucet and sink from Dupont Plumbing. 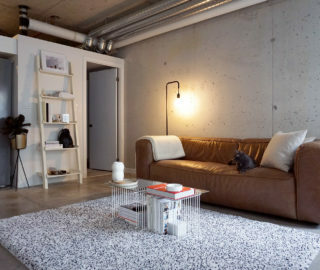 A two-sided gunmetal-clad fireplace from Ontario Heating is a visual bridge between living zones. Cast-iron table and leather sling chair by Derek McLeod Design; “Perfect” artwork by Charbonneau. 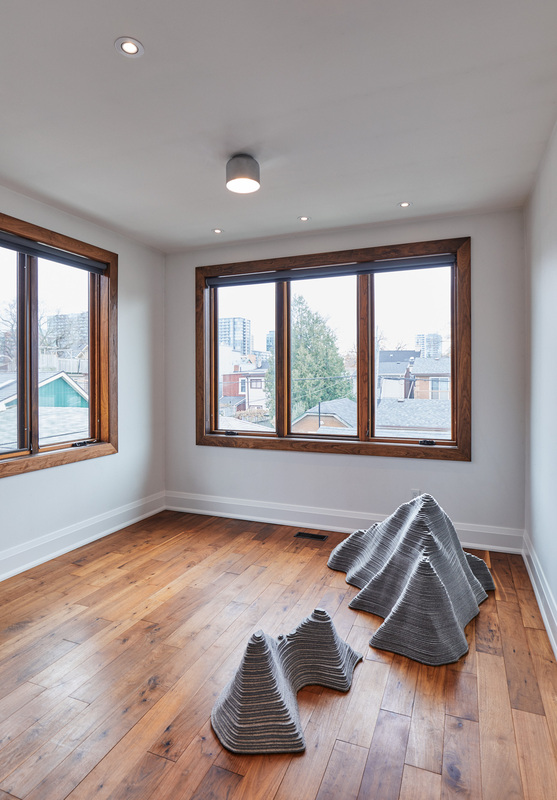 Charbonneau’s Felt Mountaintops – which depict two geological formations in Banff – dot a second-floor exercise room. Rather than getting frustrated by delays, Charbonneau took advantage of the rare open-ended time frame. 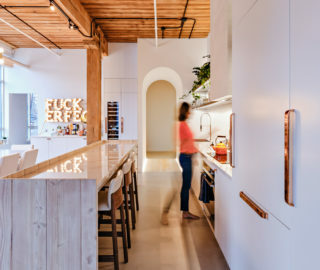 In fact, if the project was done in haste, she might not have had the idea to reuse the sheathing from the torn-down additions – beautiful wide-plank white pine boards – for the character-filled floor that runs through the main level. 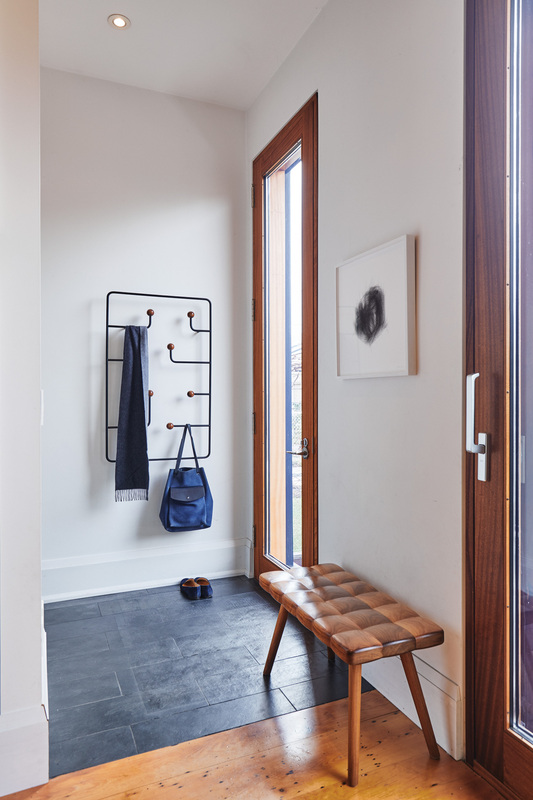 In the mudroom: the Hang Around coat rack, designed by Joy Charbonneau and Derek McLeod for Karakter Copenhagen; McLeod’s CNC-cut “tufted” bench; sapele doors from Radiant City; and slate tile from Downtown Lumber. 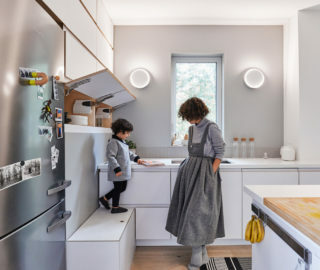 Originally published in our Designer of the Year 2019 issue as The Long Way Home.